I've just recieved my Spectromete 3.0 which I'm quite excited about. I've spent the evening putting it together but am having real struggles trying to work out where to place the new webcam as all the instructions refer to the older style. Hi @Mat , thanks for checking in! There are some helpful images on the product page in the store (also below), and you can find lots of other how-to's and activities (and add your own!) over on the Desktop Kit Assembly page . Let us know if you have further questions! 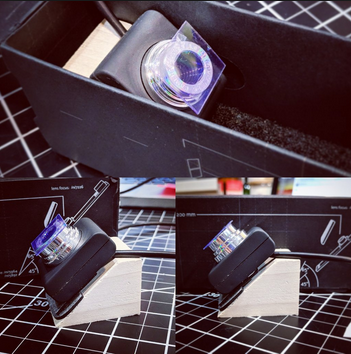 Anyone had luck with this web camera? I tried this method with no luck. I opened up the slit hole by removing the collimator so there is a huge light source. But the camera is not seeing even that. The camera does work fine, but I think there must be some sort of angle issue. I enlarged the cable hole so that the USB could fit through, and I wonder if the cable is throwing of the angle of the camera. However, my set up looks like the one above. Any thought on why I am getting no light on the camera? Hi, can you check if the (former) outer edge of your DVD, the rounded edge, is towards the top of the box? Try giving it a 90 degree turn? Otherwise i think the exact angle may be important. Can you upload a picture taken through the webcam with and without the lid open? Thanks and sorry you're having some trouble! I've tried changing the angle on the camera as suggested but still not working. I've got one of the gratings on the camera, as opposed to using the DVD for this. Needing to get this sorted soon as I'm beginning to teach spectral lines reasonably soon. Please post some pictures when you finish! Awesome! Try as I might I can not seem to get the light coming through the inlet to provide a spectra. I've tried all orientation of the grating on the lens, and also different orientation on the 65 degree slant piece. I can get the lens to produce a spectra, but that is off of light from random angels, when I expose it to open light. I noticed, for example, I can block the light from direct line to the lens, and get a spectra from the light coming from another angle, which I can block. I attempted to recreate this orientation within the spectrometer, but not solid luck. How forgiving are the dimensions within the spectrometer? For example, I don't know if I should fret about the vertical location of the camera, or the exact distance from the slit. Of course, you have to be within the ballpark, but not sure how big the ballpark is. I imitated the image provided above for placing the camera on the block. Another open air image. I noticed that I can block the direct light to get a black background, and the spectra is blocked from the same direction, about 20-30 degrees above the direct line. So, gonna work to dial that geometry in on my spectrometer. Here is a look at the set up. Maybe you all can tell if this is to far forward or up/down, or a bad orientation ( cable on top like in other pictures). Hm, this looks pretty good. Can you post a pic of the entire setup, including the lamp? I think using a more diffuse, larger light source (so alignment isn't as much an issue) may help to debug, but also, you may need to tilt the camera upwards more, so it's looking slightly further away from the opening. Can you give that a try? Note how we've put 2-3 pieces of sticky foam under the bottom edge of the camera in the pics @Bronwen posted, to slightly change the angle. I recently received this kit and got really good performance out of it. Our camera inclined at possibly even more of an angle than I interpret from the photo above. We had trouble positioning it initially and ended up taping it to the block with black PVC tape. I also cut a groove in the block for the wire. You may find you need a lot light to get a spectrum - hold it close to a CFL bulb - pointing straight up at one can be handy. I got my spectrometer working. Credit to my son who shined his iphone light directly into the spectrometer. Thanks for the tip TROYB. Somehow I must have missed that you have to really shine a light directly into the slit. I thought any amount of light, like my living room background light would work. I guess not. Had to wait two weeks, but got it outside today, more or less pointing directly at the sun.